GomX-4B, ESA’s latest and largest technology-testing CubeSat, will be launched from China early next year, together with the near-identical GomX-4A. The pair will test intersatellite communication links and propulsion while orbiting up to 4500 km apart. The cereal box-sized GomX-4B has been passed as ready to travel along with its twin from manufacturer GomSpace in Denmark in early December to begin launch preparations in China. “GomX-4B is scheduled to be launched on a Chinese Long March rocket on 1 February, along with GomX-4A, owned by the Danish Ministry of Defence,” says Roger Walker, heading ESA’s Technology CubeSat initiative. 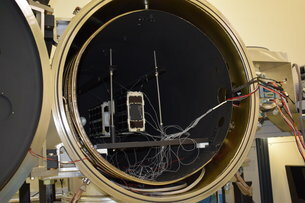 The majority of tests were made at GomSpace and other facilities in Denmark, apart from thermal–vacuum testing – ensuring that the CubeSats can withstand the hard vacuum and temperature extremes of low orbit – which took place at ESA’s technical centre in the Netherlands. CubeSats are nanosatellites based on standardised 10x10 cm units. 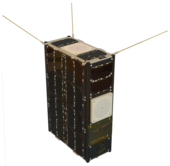 GomX-4B is a ‘6-unit’ CubeSat, double the size of its predecessor GomX-3, which was released from the International Space Station in 2015. Once released from the rocket, the CubeSats will first orient themselves to align their antennas. Then GomX-4B will gradually fly away from its counterpart, pausing at around 100 km intervals with their intersatellite links activated to see how well they work. Their separation will be controlled by new cold-gas propulsion on GomX-4B contributed by Sweden’s NanoSpace company, using highly miniaturised thrusters. They will maintain their links through flat, patch antennas and software-controlled radios at a maximum distance of some 4500 km – a limit being set by the operating concept of a minimum of 10 satellites equally spaced around the same orbital plane to form a future constellation. “As well as operating together, the two also have separate payloads,” says Roger. 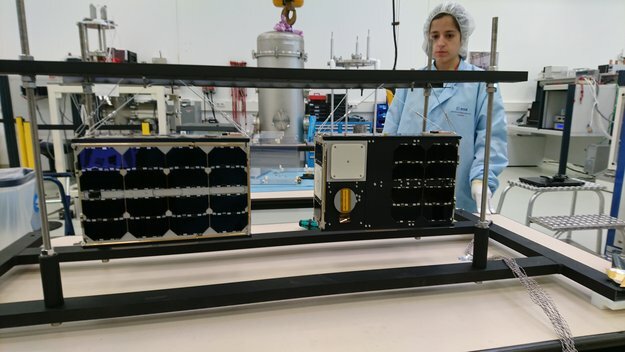 “GomX-4B is the first CubeSat to fly our new HyperScout hyperspectral imager, developed by cosine Research in the Netherlands through ESA’s General Support Technology Programme. 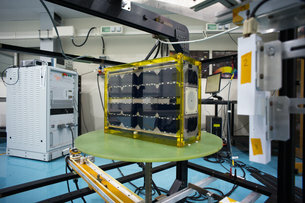 GomX-4B also carries a new small startracker for precise attitude determination developed by Innovative Solutions in Space in the Netherlands, an ESA test payload checking components’ susceptibility to space radiation, and a dedicated radio receiver to detect signals from worldwide air traffic. The pair is flying as secondary payloads with China’s Seismo-Electromagnetic Satellite, CSES-1, designed to detect precursor signals of earthquakes in Earth’s ionosphere, an electrically active outer layer of the atmosphere.